And I'm Ted Theodore Logan! Together, we are the WYLD STALLYNS! Wyld Stallyns center around the two vocalists and founders, Bill S. Preston and Ted Logan. 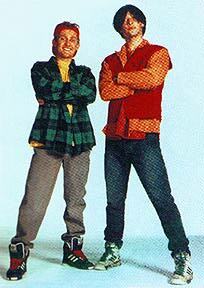 Bill and Ted are both energetic, charismatic madmen known for their outrageous and entertaining stage antics. But what holds more weight with this duo are their powerful songs that seem to inspire a deeper part of their audiences. Wyld Stallyns' earlier style was an eclectic mixture between rock, pop. and punk. Bill and Ted are accompanied by their two beautiful soulmates, Elizabeth and Joanna, who we know simply as "The Babes" and "The Princesses." Wyld Stallyns originated with the young Bill and Ted in 1979 as an after school acoustic garage band duo known to themselves as the "Crayzee Ponees." For the most part, the Crayzee Ponees remained confined to their garage existence while they constantly worked to refine their sound and image. Occasionally they would give exclusive performances to family gatherings at their homes or grandparents' homes. Their style at this time was simply referred to as "noise." In 1982 the band underwent their first major metamorphosis and soon emerged as "Wyld Stallyns" as we know them now. Their performances were still mostly conducted for their own pleasure and for anyone who happened to pass by their open garage. In addition, they did occasional public performances at San Dimas High, one of which won them the prestigious award for Seventh Honorable Mention in the San Dimas High Talent Search. As Bill and Ted grew and matured into young men, so did Wyld Stallyns. 1983 presented Wyld Stallyns with their refined style of pop and the beginnings of the increasingly successful balance of sound and mind. This transformation led to more successful performances, but they still concentrated on the local scene. Their most profound growth occurred near the end of one of their years of high school. Although the duo has never revealed what inspired them at that time, the results were nonetheless staggering. Shortly after Bill and Ted graduated from high school, Wyld Stallyns captured the Star Search Grand Prize as they appeared for the first time with their new band members, Elizabeth and Joanna. That award and sudden jump to international recognition opened up new opportunities for Wyld Stallyns. In 1984 Wyld Stallyns released its first album called "Excellent Adventure" which took chart watchers everywhere by surprise. From almost out of nowhere this San Dimas band rocked the charts with a force rarely felt from any band's virgin album. This quick climb up the charts was thought to be just the start of their success, but in a move that shocked everyone, Wyld Stallyns withdrew from the public eye after a series of highly successful concerts. When Rolling Stones reporter Robert Hager gained an audience with Bill and Ted, he asked them why the band went into seclusion. They cryptically responded,"We've been to the past. We've been to the future. We've been all around the afterlife. And, you know, the best place to be is here." What he meant by this is unknown. Many have accused Robert Hager of fabricating the quote, but he insisted it was true. In the following years, rumors flew that the band was calling it quits and that Ted left to pursue an acting career under an assumed name. A long 10 years later the Wyld Stallyns suddenly reappeared in the public arena--albeit briefly--in a few smaller gigs throughout the Los Angeles/Hollywood area to try out some new experimental sounds. In 1996 Wyld Stallyns met with producer Jack Mardsen in L.A. who teamed up with the band to create Wyld Stallyns Productions. Corbin Hennessy becomes the manager of the band. Much of 1996 was spend rearranging and creating new songs. In 1997 Wyld Stallyns again reemerged, but this time they were performing songs that would later be the backbone of their just released album, Wyld Valley. They take on the Canadian clubs at first then expand their tours into the US after a vacation in Australia. In the latter half 1997, Wyld Stallyns embark on a continent-wide "Scrapbook Tour," introducing Elizabeth and Joanna on vocals leads for the first time. Through Wyld Stallyns Productions they release a single-CD called "Child's Play" and donate all the proceeds of that CD to a charitable agency. In first week of release the single hits number one in the music charts in the US and 38 other countries. While in Australia, Shock Records, Australia's premier independent record company signs Wyld Stallyns to a long-term, worldwide recording deal in a joint operation with Wyld Stallyns Productions. In December of 1997--just in time for the Christmas rush--Wyld Stallyns release "Wyld Valley" which was an immediate success. The band has dedicated all of 1998 on a long overdue world tour which will take them through all of Europe, most of Asia, Australia, North America, South America, Africa, and the Pacific. Bill S. Preston, esquire (guitar, vocals): Founded the band with Ted in 1979. Bill is an avid history buff. He loves room service, chocolate cake, and basketball. Hates fried tomatoes and hot cloudy days. Spends a lot of his free time reading through his son's comic book collection. Joanna Preston (drums): Joined Wyld Stallyns in 1982. Cousin of Elizabeth. Hates airplanes, but loves telephone booths. Joanna is an established expert on medieval history and weaponry. Can shoot a bug at 100 yards with a bow and arrow, yet is hopeless at Nintendo. Elizabeth Logan (back up vocals, alt. drums): Joined Wyld Stallyns in 1982. Cousin of Joanna. She's a consummate graffitiist--writes on everything. Loves Romeo and Juliet (the '60s movie,) romance novels, and bubble baths. Amazing knowledge of medieval royalty. Hates television, but loves to play Nintendo with Joanna. Adam Charles (bass, guitar, back up vocals): Joined Wyld Stallyns in 1986. Stood in for Bill many times and during their hiatus went on the road together with Phil Robinson. Loves cruising in his red '62 Gretsch. Claims it's a "babe magnet." Phil Robinson: Integral part of Wyld Stallyns since 1987. Loves to surf and skateboard. Teamed up with Adam Charles performing gigs in the west coast clubs. He says his real job is carpentry, and he loves helps the stage crew set up.